It’s hard to believe that habitat loss is the main cause of decline in Chang Bai Shan as the area is vast and the habitat looks very good. But the latter two – illegal hunting and disturbance – are clearly local threats (more about that later). Although the trip was not dedicated to birding (my companions, although they humour me, prefer good walking over trying to spot little brown jobs in the thick forest), the thrill of trying to see a Scaly-sided Merganser was a fun adventure for all of us, especially given that we were able to find almost no information about where to see these special birds in advance of our visit. On arrival at the new and well-appointed spa hotel just a few minutes drive from the equally new Chang Bai Shan airport, we checked in and made arrangements to visit the national park the next day. From our room we could see Asian House Martins, Red-rumped Swallows and Barn Swallows all gathering mud and building nests on the hotel itself.. a good start. 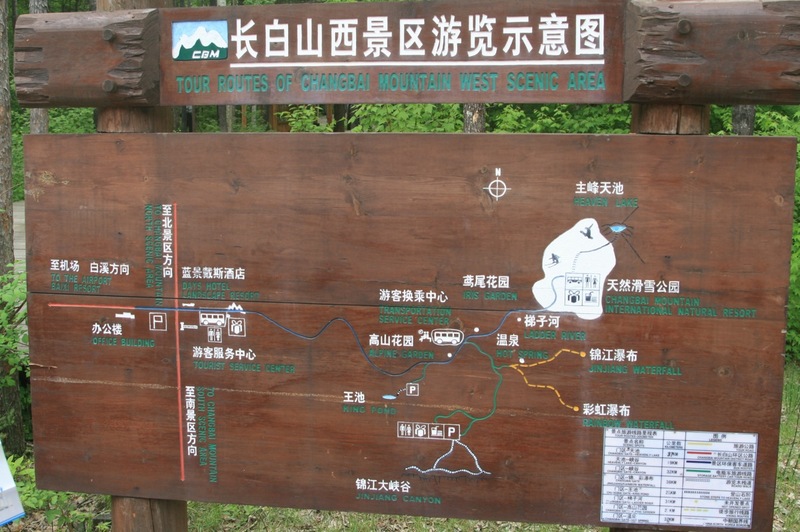 For anyone who has visited a mountain in China, the following tale of our visit to the national park will be all too familiar. We were bussed to the entrance of the park where we were obliged to buy an entrance ticket for 100 Yuan (about GBP 10) and a bus ticket for 85 Yuan (GBP c8.50). After boarding allotted bus number 2, we set off for the 45 minute direct (ie no stopping) journey to the peak. The habitat looked great – broad-leaved forest, followed by birch, larch and, as the trees thinned, more open areas with stunted birch still leafless as if it was mid-winter. Part of the way up, I was fortunate enough to catch a glimpse of a Hazel Grouse as it whirred its way across the road in front of the bus. At the top we disembarked and set off on the wooden steps to the peak (2,470 metres) for a view of the lake. There were marshals and signs telling us not to wander from the well-trodden path (possibly due to the proximity of North Korea which lies on the far shore of the lake). At the top one enjoyed a spectacular view of the “Heavenly Lake” which sits inside the crater of an extinct volcano (well, at least we *think* it’s extinct – it last erupted in 1903). 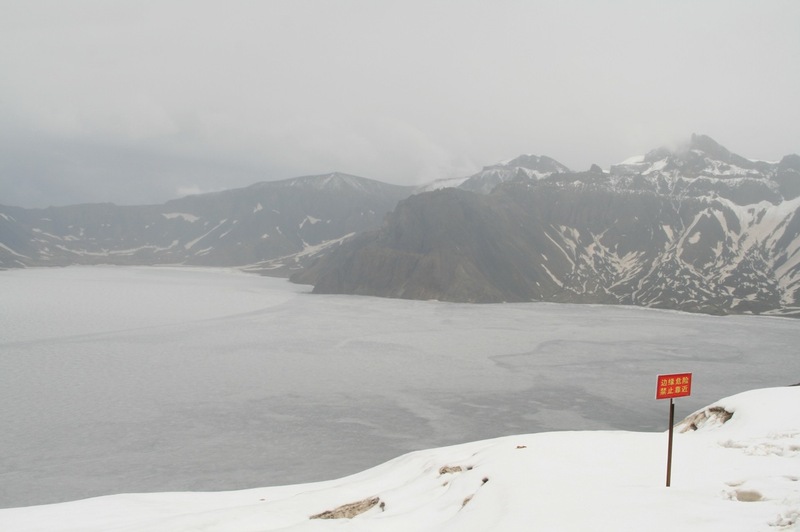 In a sign of how late Spring springs in Jilin at this altitude, the lake was still completely frozen. With quite a bit of low cloud around, responsible for the occasional showers, I suspect we didn’t see the lake at its best. But it was still impressive. 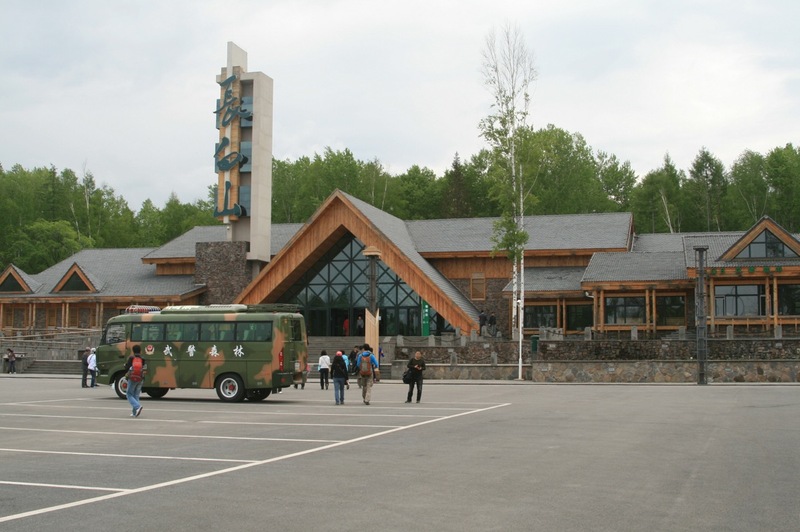 The visitor centre at the West Gate of Chang Bai Shan. 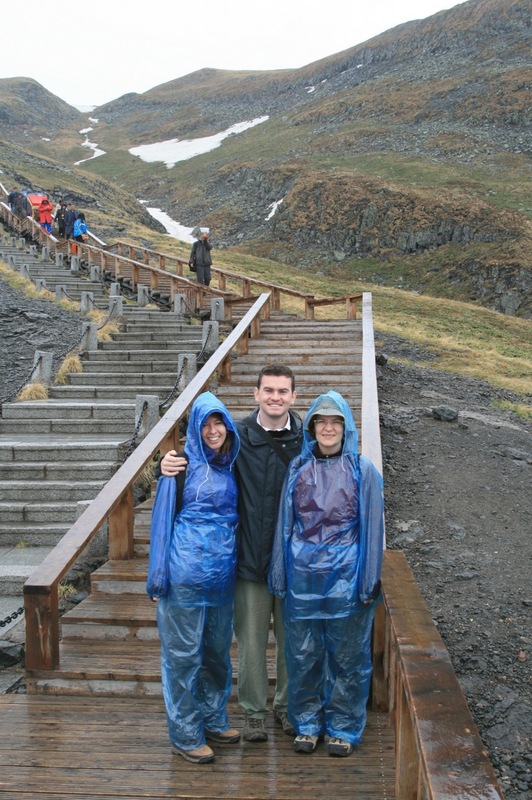 The walk up to the “Heavenly Lake” at Chang Bai Shan. 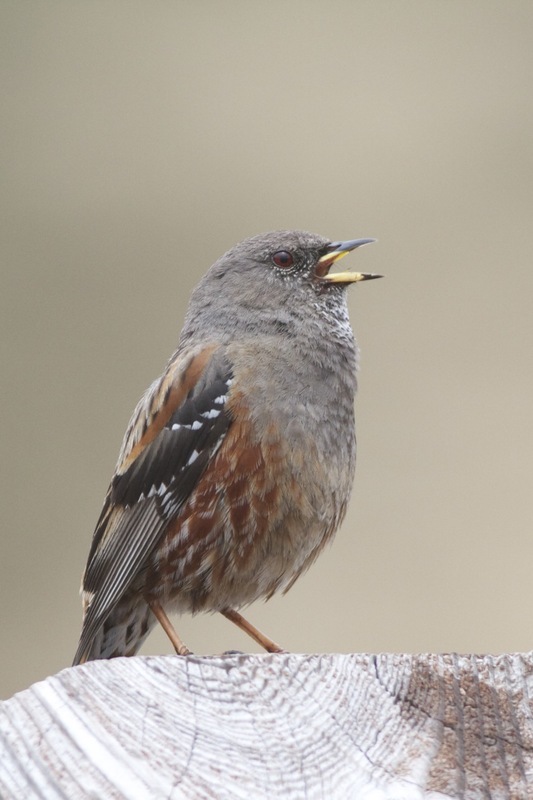 Alpine Accentors were displaying alongside the boardwalk! The view of the lake.. with North Korea on the far shore. It was here that we enjoyed stunning views of displaying and singing Alpine Accentors.. there were at least 4 pairs around the summit. And here is a short video..
After the summit, our bus took us to the next stop on the rigid Chang Bai Shan mountain tour. 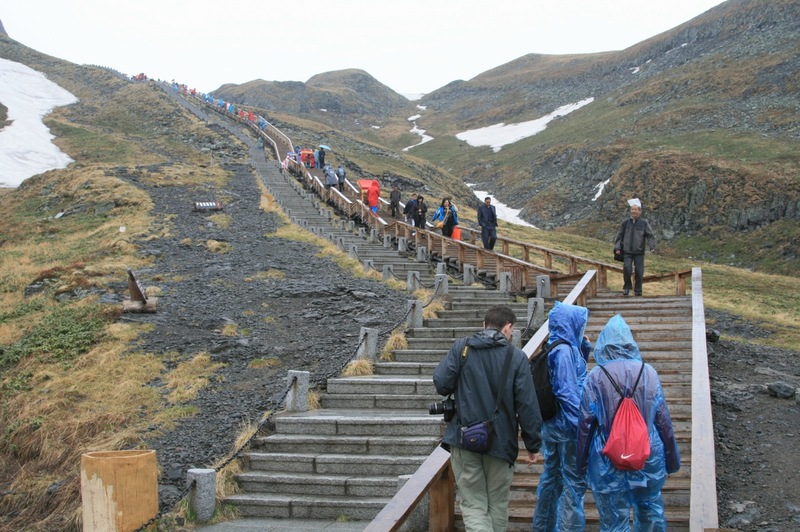 The circular boardwalk (at an altitude of 1464 metres) cuts through some fantastic forest and we saw singing Mugimaki Flycatchers, Black Woodpecker, Pallas’s Warbler, Goldcrest, Hobby and Siberian Chipmunk here. Unfortunately the trail down to the waterfall was closed (for reasons unknown) so at the end of the boardwalk circular tour we were bussed back to base, missing out on some fantastic looking habitat that looked perfect for Three-toed Woodpecker and Nutcracker. We decided to walk back from the park entrance to the hotel, a journey that I estimated would take around 30 minutes but which actually took an hour and a half. (oops, sorry guys!). But it was a good walk and we saw Grey Wagtails, White Wagtail (ssp leucopsis), Jay, Siberian Blue Robin, Eurasian Sparrowhawk, Dollarbird, Eurasian, Oriental and Indian Cuckoos, singing Yellow-throated Bunting and heard a few unidentified thrushes (one of which I subsequently identified as Pale Thrush). Scaly-sided Merganser, Song Jiang He, Jilin Province. Note the dark line that separates the broad white wing panel which distinguishes this species from Common Merganser (Goosander). 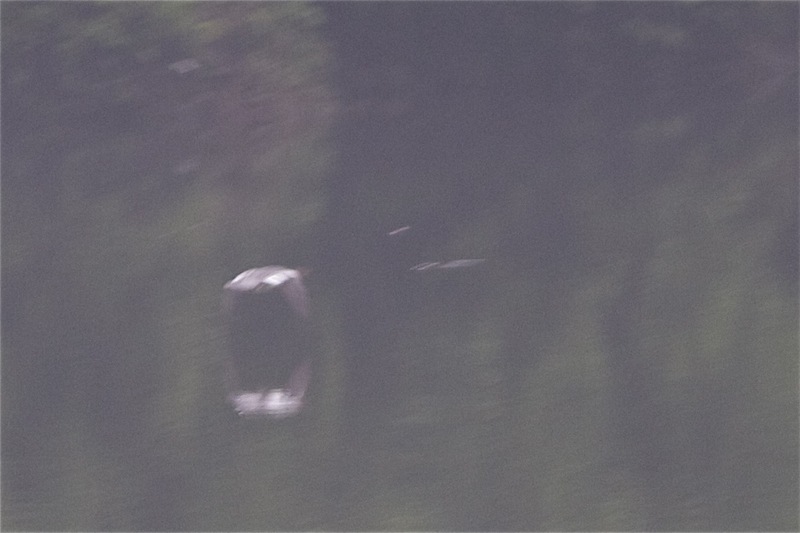 The bird flew around the bend in the lake and we thought we may be able to see it from the other side. We drove around but there was no sign. It could just as easily have flown up into the mountains. The driver seemed to be relieved (I think he felt a bit bad that we hadn’t seen it at the original lake) and we arrived back at the hotel elated. That evening, after a well-earned dip in the outdoor hot spring, we decided to try a local restaurant in the village near to the hotel. We enjoyed some delicious food, including a local trout, and toasted our good fortune with the merganser with some local “Dong Bei” beer.. The owner had a couple of stuffed birds in the restaurant and we thought it would be worth a try asking him whether he knew where to see Scaly-sided Mergansers.. he proudly said that they bred locally and then proceeded to his fridge whereupon he took out a dish full of eggs… “Zhong Hua Qiu Sha Ya” (Scaly-sided Merganser) he said with a big smile on his face….. I think my jaw dropped to the floor at this point and I didn’t know what to say. Did he really have a clutch of Scaly-sided Merganser eggs in his fridge? Oh. My. God. John asked to take a photo of them and he duly obliged. 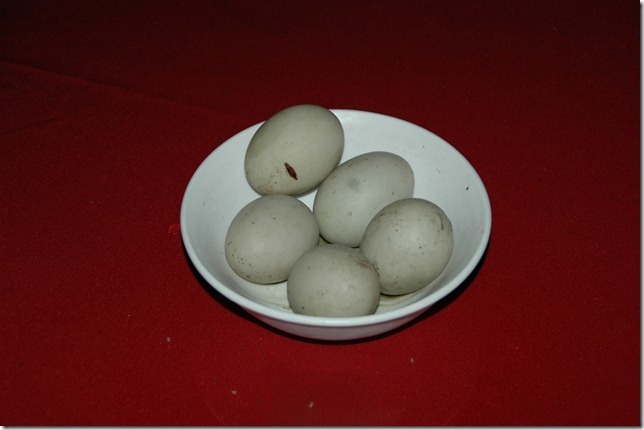 These eggs were supposedly taken from Scaly-sided Mergansers… I really hope they weren’t. The owner also showed us a photo on his digital camera taken last July from outside his restaurant (which looks across a small manmade lake). On the lake there was a very smart breeding-plumaged Black-throated Diver. He said it was there at 0500 and then flew away later that morning. We left the restaurant a little disturbed that the local restaurateurs may be collecting the eggs of an endangered species for food. A local education scheme is much-needed, I think (WWF/RSPB – any plans?). The next day we decided to explore the area north of our hotel and, using the same taxi driver (Mr Wang), we soon found an excellent fast-flowing river with a track running alongside. We walked upstream and, after only a few hundred metres, we encountered Brown Dippers and Grey Wagtails.. and, best of all, the river looked perfect for mergansers. A little further along, a Brown Dipper perched on an exposed rock allowing us all excellent views. Just as we were about to move on, Sarah spotted another bird on the water and asked me “what’s that?”. 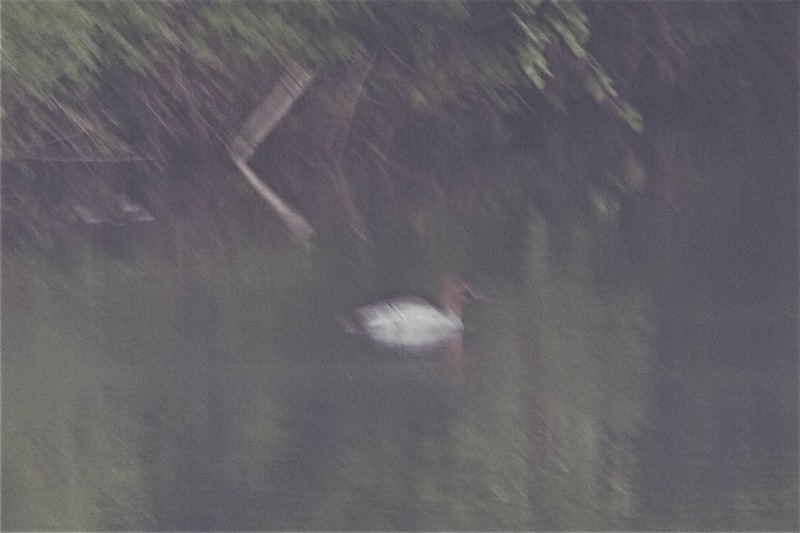 I looked and could immediately see it was a merganser and a quick check in the binoculars revealed it to be a Scaly-sided…!! Wow! It swam towards us with its head in the water and then dived. We all waited quietly for it to emerge but it must have surfaced some way from where we were looking as the next thing we knew it was flying upstream and was gone.. a brief but ‘better than yesterday’ view.. After ‘high-fiving’ Sarah we walked further along the track and saw a few Blue and White Flycatchers and some more Brown Dippers. After a further couple of kilometres we found an open area on the bend of the river and sat down for our lunch. It was here that we saw another female Scaly-sided, again briefly, as it flew right over us and upstream. Bird number three. A pair of White-throated Needletails kept us company as they hawked for insects overhead. Scaly-sided Merganser woz ‘ere. The bend in the river where Sarah spotted a female. The walk back was uneventful but we did hear Oriental Cuckoo, Siberian Robin, more Blue and White Flycatchers and a thrush sp. The next day we explored more tracks around the hotel and close to the border of the national park, seeing new birds for the trip such as White-backed Woodpecker (found by Libby! ), Long-tailed Rosefinch, White-throated Rock Thrush and Pale Thrush. Just as we got back to the hotel to shower and check out, the heavens opened and we thanked our lucky stars that we had enjoyed the best part of the day. We’d enjoyed a thoroughly refreshing break in this special part of China – a real tonic after the smog and oppressive heat of Beijing – and, best of all, we’d seen the near-mythical Scaly-sided Merganser! Maybe there will be one in Beijing when you next come this way! Thanks Tom! I love Dong Bei !! The merganser topic immediately got my attention but the news of the eggs ending up as a dish in the local restaurants deeply pulled my mood off. May be you can fly down to Jiangxi during next winter and have some good looks of the merganser. Hi Dev. Yes, I was shocked. There really needs to be a local education plan to raise awareness about the plight of the Scaly-sided Merganser. Apparently Chinese bird photographers do visit the area to photograph them when they are on the lakes (in April and probably also in autumn) – it would be good to demonstrate that the birds are worth more to the local economy through eco-tourism than through taking their eggs. We avoided any egg-based dishes just in case. It is a good idea to do whatever can be done about educating people, indeed. Of course it’s hard to say, but in this case I would also tend to be very surprised if the “specialty” was as special as claimed. I guess that “special” (popular just because they’re hard to obtain) foods are more often common items being sold under another name. However, it will be interesting to see the pictures of the eggs and see if those who know can speak to what they are. In the bigger picture, unfortunately it might not be easy to change the minds of those who want to prove their power by paying outlandish sums for items (i.e. animal parts) merely because they are rare or hard to obtain…. Anyway, a great trip! I have been invited up to that area for bird watching (by a non-bird watching friend) and have wondered what might be seen – this has been very inspiring! Thanks for writing it up. Hi Gretchen. I suspect you are right but the fact that Scaly-sided Mergansers eggs are considered a delicacy is worrying for the species’ future in China. If you get the chance to visit that part of the world, I would recommend it. Lovely forest and very different to Beijing/Bohai Gulf. Another great place in this amazingly diverse country! Big thanks to you and John for your great company over the weekend – it was a lot of fun! And well done on the SSM sighting – awesome spot! Enjoyed reading this very much. There is a chance I will visit this area in the future. Now I know what I need to look out for (in the natural arena and restaurants!). Thanks Bart. Happy to help with more precise information if you do go.. So, now the eggs are pictured, we just need someone who can tell “duck” eggs from those of scaly breasted mergansers! Not sure I can do that research, hope others can…. Yes, I guess there aren’t many people with experience of Scaly-sided Merganser eggs.. but hopefully someone out there can give a qualified opinion. UPDATE: I have it on good authority that the eggs are almost certainly NOT Scaly-sided Merganser eggs. That is good news. However, it’s worrying that a local restaurant owner thinks it’s prestigious to serve them – a local education programme is clearly needed as part of any strategy to save this species. With its thin red bill and delicate scale pattern along its flanks, the scaly-sided merganser is a strikingly beautiful bird. It breeds in far eastern Asia, where China, Russia and North Korea meet. The species faces a number of threats, from logging, hunting and fishing in the breeding grounds, to pollution and major habitat changes in the wintering area. Recent surveys suggest that the scaly-sided mergansers are not as widespread as hoped, and the population is largely restricted to the Primorye region in the far south-east corner of Russia (1,500 pairs), with a further 200 pairs in north-east China. 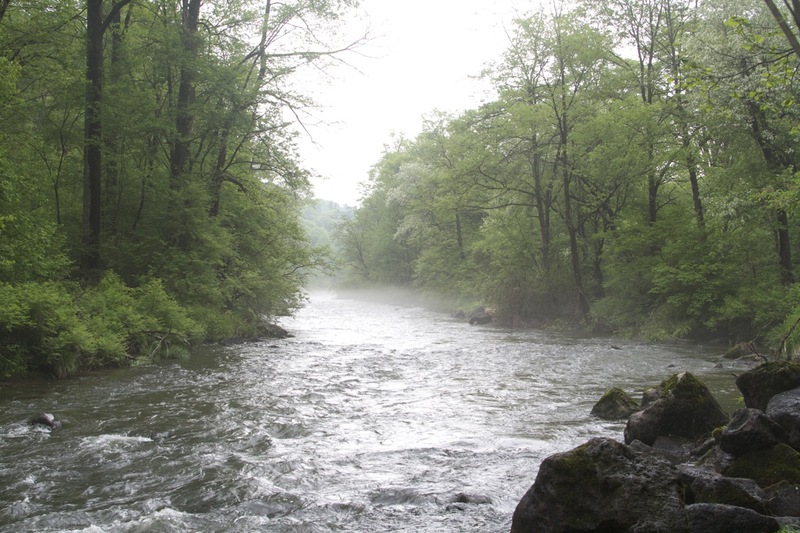 This remote, densely-forested location hampers monitoring and conservation. 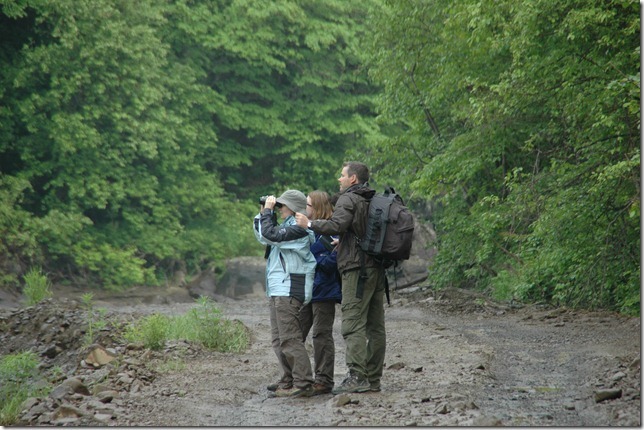 WWT has been closely supporting a Russian team to research the merganser and initiate conservation in its breeding area. Led by Diana Solovyova, the team has erected almost 200 nest boxes to replace potential nest sites lost to logging. As the nest boxes were far more popular with the birds on logged than on un-logged rivers, it seems that the availability of nest-sites may be limiting the population. 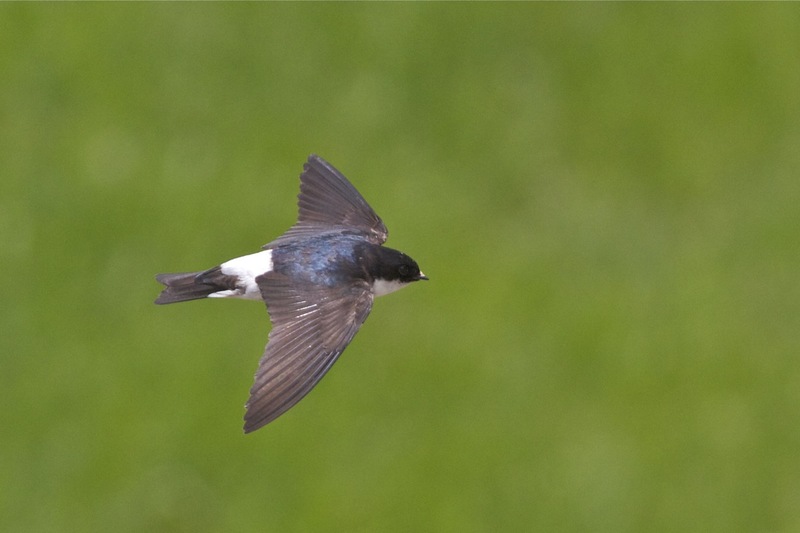 More nest boxes could lead to further population increases.